US-based death/black metal band Cast The Stone, comprising original members Mark Kloeppel (Misery Index, Scour), Derek Engemann (ex-Cattle Decapitation, Scour), Jesse Schobel (Legend, ex-Scour) and vocalist Andy Huskey, will re-emerge on August 31st with their new EP on Agonia Records. The band's new EP, titled Empyrean Atrophy, is pictured below, and features cover artwork by Gary Ronaldson of Bite Radius Designs (Primordial, Kreator, Napalm Death). 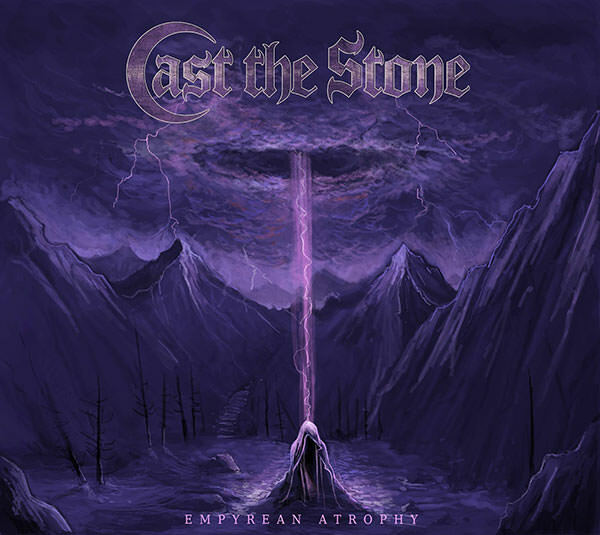 Hybridizing the dark ferocity of Swedish death metal through a lens of American brutality, Cast The Stone hits a creative stride with Empyrean Atrophy. Guitarist Mark Kloeppel commented, "The band's sound is a testament to an enduring spirit that's driven us to return to our most organic influences, merge them together, incorporate disparate elements, and forge our own sound. Each person has a distinct sound unto themselves, so it's really cool how smooth and cohesive this stuff comes across. You can immediately hear how different this is from the other things we've been involved in, yet it's still very true to our individual styles. Our bassist Derek progressively weaves my guitars and Jesse's uber-creative drumming style together in a way that only he can. This is all crowned off by Andy Huskey's crazy death metal vocals which are... well, just listen."